Where to get? : Adventure seek with explorer or ? You can send General to position G1 and G2 anytime you want. Just select general and select transfer and move to wanted postion. You can put General to G3 when you destroy bone church. In worst case scenario in camp 7 after you send 134 Recruits suicidal wave there is litle, unlikely chance, that some of Dark Priest troops survives. If that happens send 30 Recruit and 170 Lonbowman. Pirates blocking method 1. Tested, works fine. After the general A reaches the red circle, send general B to camp block 1. Note that I’m using a lot more soldiers than previously for this adventure! Note also that this is based on solo playing. You need at least 2 generals, one normal and one veteran. You need to send troops 5 times. ANY – Can be any kind of general. First send your normal general from garrison A to camp 5 with 17S. 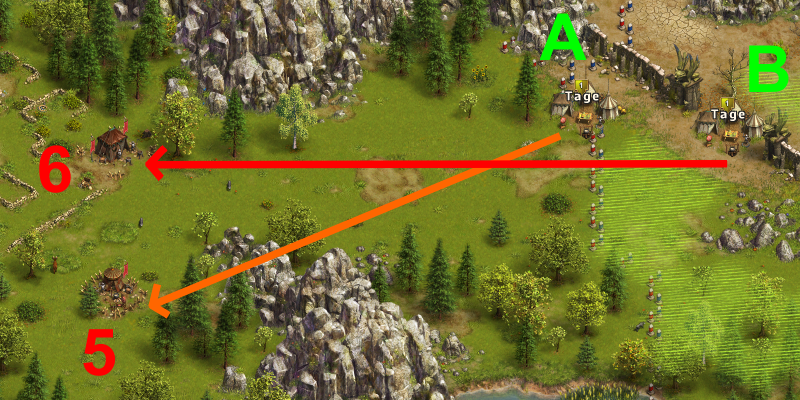 This is optimised for maximum number of rounds, so do not change the number of units! Then send your veteran general from garrison B to camp 6. You cannot be too fast, so send this general as soon as you can.